Binzel® compatible PSB 31 consumables suitable for various Chinese & European plasma cutters as well as some Sealey and Clarke machines, compatible with the Binzel PSB 31 torch which is used on various plasma cutters. 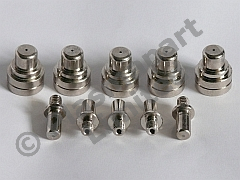 5 nozzles and 5 electrodes - altogether 10 consumables. This pack is supplied as shown, and contains 5 electrodes, & 5 nozzles.